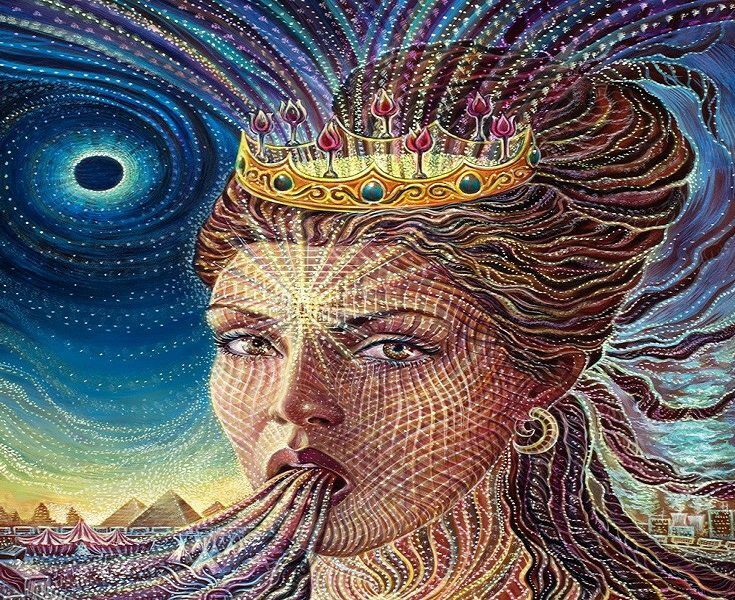 The Priestess has been in the spotlight much of my life, guiding it in the direction of growth and evolution. However, her influence was not always so directly manifested…. The Priestess and Maiden went through a tough time many years ago, when the Priestess began to align with her purpose as a healer and teacher. This mirrored stages in my own inner transformation, where a part of me was ready to make changes and shift the reality, while another part lagged behind. That part that weighed on me like a ball and chain tying me to the past was my wounded part – the one that did not believe in something bigger, greater, complete, the one that held fiercely to disbelief, hurt, and lack…. This Maiden was so terrified from showing up in the world that she almost sabotaged our opportunity to teach subjects in a spiritual school. At that time, the Priestess had to put all of her effort into overcoming the fear of criticism and rejection, activated by public speaking around the Maiden energy, and lovingly forcing her for three months to “get on the stage” and do the job daily. The Priestess wanted to get into that position for many years as an opportunity to grow into her potential. She saw herself doing the work with joy, and benefitting others through it. Finally, there was an opportunity and no joy in it! The Maiden suffered every single day while doing it, and could think of nothing but escaping and hiding somewhere else, never to return to the “stage” again. The Maiden was terrified by the possibility of being visible beyond her comfortable world, and she was ashamed at the same time for wanting to stay small and insignificant. Thus these two wrestled in my heart…. I listened intently to the Priestess. Her signals were clear, and as I progressed with my spiritual, yogic, and feminine practices the messages became more precise, subtle, and at the same time undeniable. She was not so much sending signs or signals to me anymore, she was more like internally talking to me, or appearing while floating over my mind as a foggy cloud. The Priestess had been deeply in her purpose of sharing her gifts – no doubt about that – although she had taken some turns along the way. There was no other way out of the situation than going through it, since the Priestess was committed to the process, and ready to push me through it. What a feeling of freedom for everyone involved! The Priestess could then come through and shine, shine, shine… while the Maiden had learned to expand with joy into even bigger challenges.